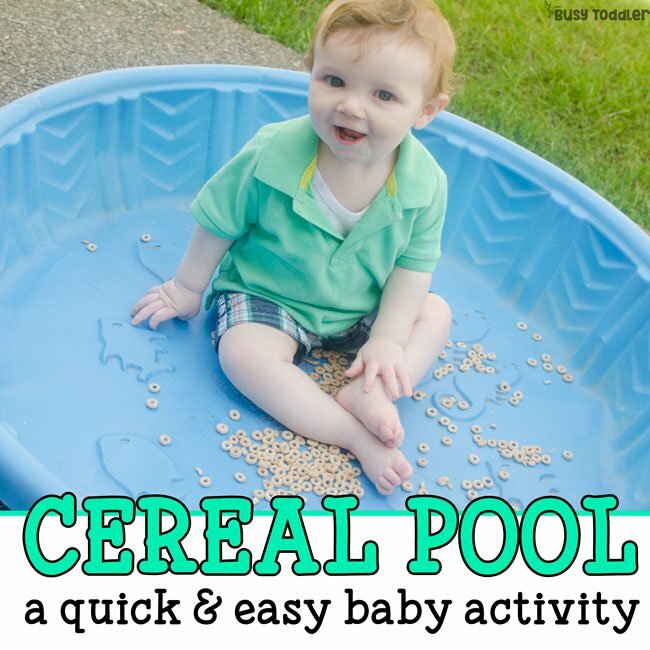 Time to have some fun with a baby sensory bin! My third born is ready to rock and roll. He is done with babyhood, he’s ready to move on, he wants to have fun with the big kids. I can’t blame him – those two have an awful lot of fun. Who wants to be stuck being the baby? 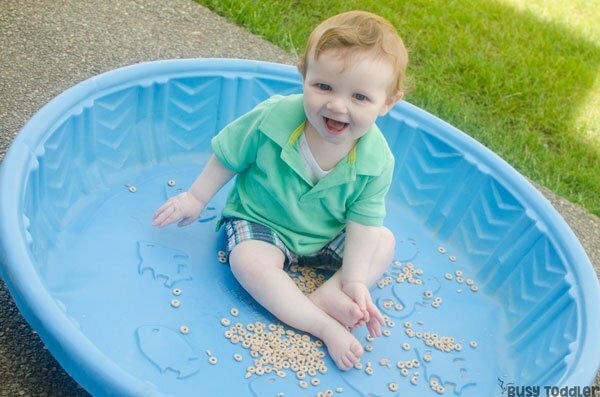 Even though he’s only 9 months old, he can still join in on our activities fun with his very first baby sensory bin. I like to joke that my kiddie pool has been voted “Least Likely to Hold Water”. And that’s so accurate. I’m always filling it with corn meal, or mud, or Jell-O. OR turning it into a baby sensory bin. Just because he’s a baby, doesn’t mean my son doesn’t want to play or that I don’t sometimes need him to be entertained for a minute. Sometimes, even babies get bored. 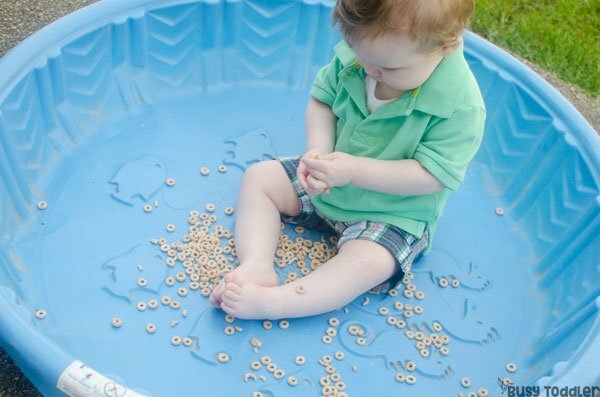 That’s how this cereal pool got started. I needed to help the big kids in the backyard, but where do I set the baby? On the hard patio? In the wet grass? In the dirt that he’ll just start eating? I know! An empty kiddie pool! It’s the perfect outside “play pen” for him. But, what to have him play with? All the outside toys are well, outside toys that should never be put in anyone’s mouth (yikes) so I ran to grab my go-to baby activity supply. 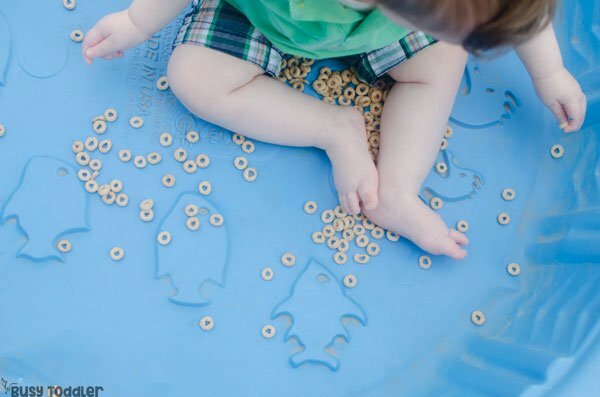 Cheerios are magic for babies. They can pick them up, they can move them, they can eat them. It’s a win, win, win. 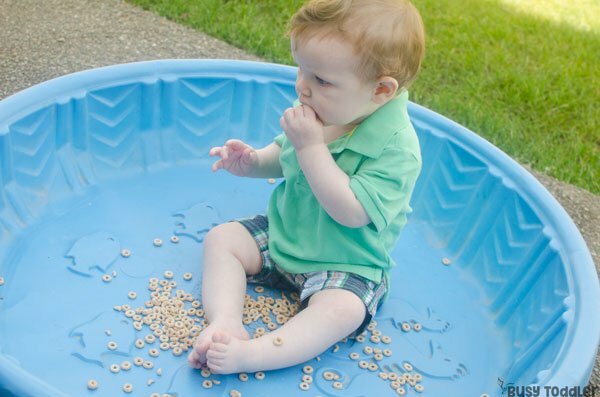 I wiped out the kiddie pool speedy fast, set baby inside and dumped Cheerios all around him. He was the happiest baby on the sensory bin block. Babies are not the easiest crowd. Babies are not easy to entertain, even though you’d think they would be so I was stoked when my son sat quietly in this bin for almost 10 minutes. That was 10 minutes outside without having to hold a 20 lbs sack of potatoes. It was magical. 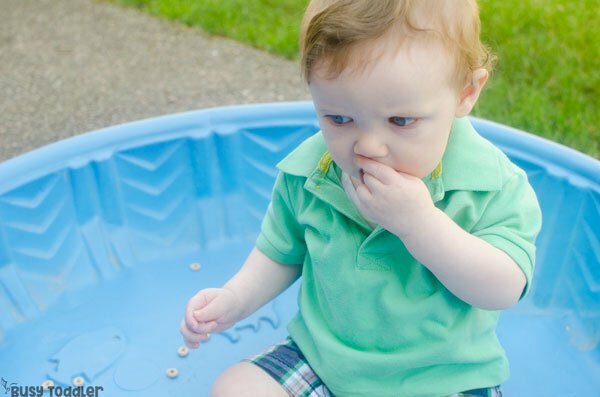 This baby sensory bin has now become a staple at our house and the easiest way to let baby enjoy nature with his siblings while giving him something to focus on. I am very much supervising him the whole time, as I do with all baby and toddler activities. 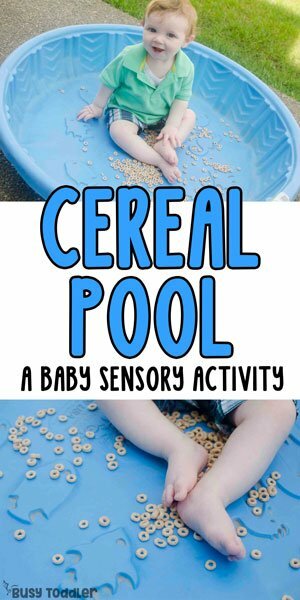 If you’ve got a baby that can sit up and is starting to learn to pick things up, I hope you’ll give this baby sensory bin a quick go. Let me know how it turns out for you – it’s been a big hit at our house. 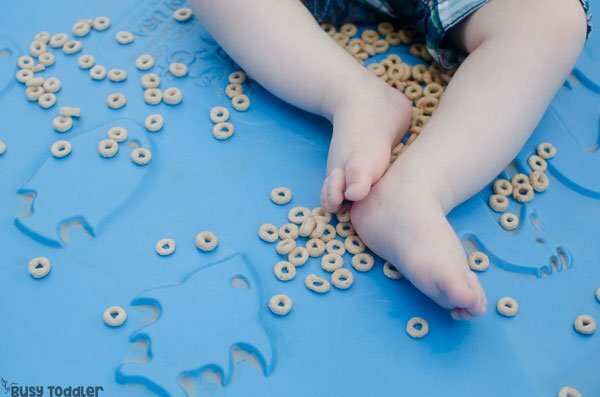 Think you’ll try this baby sensory bin?